Paddy, Bea and Joan attempt to escape via the trap-door to the roof but Joan falls from the ladder back into the corridor. Written by Anne Lucas - though her name is spelt "Lucus"
At least 40 women can be counted arriving at Woodridge, though there only seems to be one small minibus! The fire engines arrive and Erica is brought out safely. 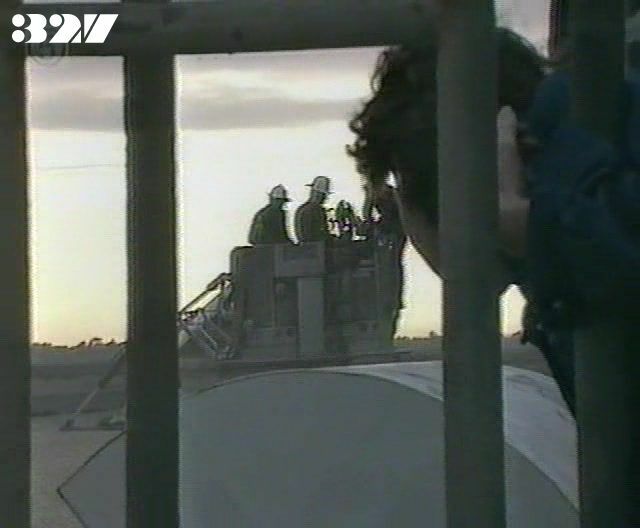 Paddy crawls through the ventilation shaft. Colleen reports that the head count shows four prisoners and Joan missing. Joan begs Bea to give her the keys to help them get up on the roof: Bea tells they are going to die together, and then loses consciousness again. Paddy climbs out of the shaft at Bea's side of the locked gate. She hestitates to unlock the gate until and distant boom and sudden onrush of smoke convince her, but she forces Joan to pick up Bea and carry her to safety. Some of the women shelter in the visiting suite: Chrissie feels responsible but puzzled how a pile of burning books could have destroyed the whole prison. Two bodies are brought out : one is identified as Barbara, but the other is thought to be either Mouse or Paddy. Ted Douglas arrives to survey the situation and delivers Paddy's release form in person. Paddy opens the roof trapdoor, but when Joan tries to get Bea up the stairs Bea falls backwards, knocking Joan off the ladder. Paddy sees the fire engine lift arrive on the roof and Bea and Joan are lifted off on stretchers . Meg tells the women that Bea and Paddy are safe, but that Barbara's body was found in the Governor's office and that the second fatality is thought to be Mouse. Officer Bailey comes to whisper to Meg that Joan is also safe, which Chrissie overhears, and she laughs bitterly at the pointlessness of the whole exercise . As Joan is winched down from the roof, she tries to talk to Erica and Ted, but neither of them can understand what she is saying. Ted Douglas orders Erica not to speak to the press. The women are sent off to Woodridge, which makes Chrissie nervous in case she has to face Neil again. Meg tells Paddy she is free to leave hospital as soon as the doctors give her the all-clear and suggests she goes to live at the halfway house. Erica goes to hospital with Joan. Bea finds out she's in the next bed to Joan when a nurse pulls back the screen. Deputy Governor Carlson welcomes the women back to Woodridge. Chrissie and Margo see Andy and agree they should try to get a message to him that Paddy is all right. The women protest at the poor conditions they will have to live in. Margo thinks she notices a certain chemistry between Colleen and Geoff Carlson. Paddy tells Judy about the fire, and Judy is particularly upset to hear of Mouse's death. Maxine surprises Paddy by revealing that she is living with Tony. Andy helps to deliver the meal to the women and finds out from Chrissie that Paddy is in hospital. She notices that he has a black eye and tells Margo she thinks he's been in a fight, but Margo points out that Chrissie's little doublecross on the Woodridge men might have got them annoyed. Judy confronts Tony over what his attitude is to Maxine and tells him he can't just sit back and do nothing. Maxine cooks a meal for Tony, lights a few candles and waits for him to arrive, but he is prevented from leaving the halfway house when Sara throws a weeping fit at the end of a sad film. The women are concerned for Jeannie's health in the conditions at Woodridge. Geoff Carlson and Colleen get chummy and he ends up giving her a neck massage . Erica is at Joan's bedside when she comes round and asks "Fields..? ": she tells Joan that Barbara is dead, and Joan sinks back with a contented grimace on her face. Tony goes home very late to find Maxine asleep on the couch. Erica looks over the blackened ruins of her burnt-out office, and is surprised to be told of the breach of regulations in storing turps in the same store room as the fuse box. DS Farmer goes with Erica to talk to Joan in hospital: she accuses Bea of attacking her and trying to kill her, adding that Bea admitted to her that she started the fire as a diversion.